Ray Boutwell and his eight brothers grew up on a Vermont farm where their mother baked 11 loaves of bread every other day. She made doughnuts too, and on summer weekends she hand-cranked her own ice cream. Caroline Boutwell’s seventh and only surviving son is rather fascinating himself. 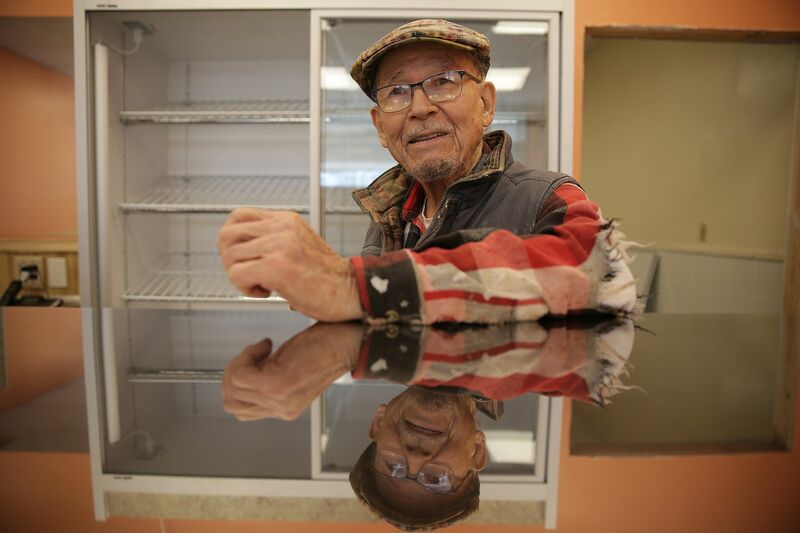 At 92, with more than half a century of professional baking behind him, Boutwell, an accomplished carpenter, portrait-painter, and grandfather of two, hopes to open a new bakery called Ray’s Boozy Cupcakes by late spring. He got the idea for liquor-flavored sweets from a waiting room magazine at his cardiologist’s office. Last October, he began renovating storefront and kitchen space in Southgate Plaza on the 1200 block of Haddonfield-Berlin Road in Voorhees. He hoped to open before Christmas, but now he’s aiming for Mother’s Day. Boutwell served in the U.S. Navy as a mess cook. After the war he took baking and cooking classes at a technical school while also “pumping gas and greasing cars” at an Esso station in Atlantic City. A couple years later he and his wife, Rosana, moved to the Philadelphia area for more year-round employment opportunities, eventually settling in Cherry Hill, where he still lives. Taking a break from working in his soon-to-be bakery, Boutwell was sharp and spry and not a bit shy. He rolled stories out like dough. After McClintock’s, Boutwell worked for the Holly Bakery, at the old Ivystone Inn on Route 130 in Pennsauken, and had his own business — Boutwell’s Pastry Shop — in West Deptford for 18 years. “I was mostly known for my miniature pastries and cookies, and I made a great Philadelphia butter cake. I got that recipe off of a guy I worked for at Rhawn and Verree in the Northeast. He got the recipe from someone else. I’ve got an old German recipe for cheesecake that uses cottage cheese, too." After closing his store in 1990, ostensibly to retire, Boutwell worked during holidays for a Bellmawr bakery, “where I used to lay out five pans to the other guy’s one.” He saw a newspaper advertisement for decorators needed at Tiffany’s Bakery in the Gallery in Philly, and stayed for more than a decade. In 2012, after his wife died, Boutwell kept busy but eventually found himself feeling listless. “I was depressed," he said. “I was painting five or six hours a day, but I wasn’t selling anything. Every afternoon around 1 o’clock I had to take a nap, and I said to myself, ‘I’ve got to do something more physical, or I’m going to pass.’ Now I work eight, nine, sometimes 10 hours at day in the new place, and I really feel great." Ray Boutwell is working to open his new shop in Voorhees, N.J., by Mother's Day. The 92-year-old retired baker calls his business Ray's Boozy Cupcakes. Said Rosana: “It’s made him feel younger and has really energized him. He’s very driven. I call him a Renaissance man, because he’s done everything. He built a house, he does stonework, he does some sculpture, he’s a portrait painter. Rosana and other family members have helped out at the new shop, and her father has hired painting professionals and other subcontractors. “One guy was 70, and worked him to the ground,” said Boutwell, who has sunk a chunk of his savings into the project. If progress on the bakery itself has been slower than expected, he’s had plenty of time to do market research and experiment with recipes, many of his own devising. Not a drinker himself, Boutwell also plans to offer conventionally flavored cupcakes and other sweets. “My dream is, if this takes off, I’m going to rent the space next door, and do boozy ice cream. I want to do it at the level of Ben and Jerry," he said. Boutwell plans to call his next venture Caroline’s Ice Cream. Ray Boutwell laughes as he pauses from the work to open his new shop in Voorhees. Boutwell, 92, is a retired baker who's coming out of retirement to open a new bakery specializing in booze-infused cupcakes. It will be called Ray's Boozy Cupcakes.